With the stock market at an all-time high, with unemployment at 5.8 percent, last quarter economic growth at 5 percent, relative mild consumer price-inflation, and the bonanza of cheap gas, there is increased optimism about the U.S. economy. Yet challenges abound, both coming from the inside and from abroad. Participation in the labor force remains at the lowest levels since the late 1970’s, with over 6 million less people in the workforce since President Obama assumed office. The time of reckoning for the Fed is arriving. It will likely begin introducing higher rates early this year. If it waits until 2016 it might risk causing a negative short term impact just before the presidential election. Not good for Hillary or any incumbent party’s candidate. 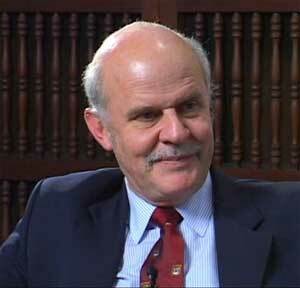 In a recent article for the Wall Street Journal, Martin Feldstein wrote, “Unconventional monetary policies such as quantitative easing increase the risk of financial instability. Traditional Keynesian policies attempt to raise aggregate demand by increased government spending and reduced tax revenue increase budget deficits and national debt.” With over 7 trillion of new borrowing no other president in U.S. history increased the debt as much as Obama. Eventually these policies need to be reversed, causing painful readjustments. Nevertheless, easy money remains so popular that Feldstein forecasts that Europe, risking a new recession and more populist upheavals, will soon engage in monetary easing. In such scenario, with monetary easing in Europe and more prudence in the Fed, the U.S. dollar could likely strengthen another 10 percent against the Euro. One year ago I wrote that “national or international security threats, such as acts of terror or wars affecting the U.S. or its major allies” could impact the U.S. economy. We had two such major threats: Russian intervention in Ukraine and the rise of the Islamic State, ISIS. They both have increased uncertainty in the world and the U.S. economy. Sen. Rand Paul, the most libertarian Republican presidential hopeful, stated that he would vote for the authorization of ground troops to fight ISIS. Sen. John McCain is pushing for increased involvement in Ukraine, especially by providing more weapons. Economic actors need to ponder if the U.S. will get even more involved in overseas wars. Unless you believe in a simplistic Keynesianism that destruction can cause higher growth, these continued threats from abroad increase the chances that the U.S. economy will not be able to reap all the benefits of the new energy scenario. Few forecasted the magnitude of the impact of increased oil and gas production in the US. One who did was Bill Conerly, a contributor of Forbes.The reduction in the price of oil is strengthening the U.S. economy and reducing the power of Russia and the impact of ISIS and other nefarious Middle East forces. Another challenge for the U.S. economy is the uncertain result of the political battles over healthcare and immigration. There are legitimate disputes about the cost and benefits of Obama’s policies. The impact of the Affordable Care Act on the economy was well explained by Casey Mulligan, of the University of Chicago, during the annual Free-Market Forum organized by Hillsdale College. Mulligan argues that the major negative effect of Obamacare is to reduce productivity. It is increasing the cost of full-time employment and encouraging part-time work. I expect that it will also lead to an expansion of the “under-the-table” labor market. People with low income qualify for Medicaid and thus avoid health care insurance costs. Rather than seeking full employment many might want to stay at their current job and work extra hours in the informal economy. In addition to the economic costs, healthcare reform was one of the main reasons for the electoral loss of the Democrats during the midterm elections. The recent amnesty for a sizeable number of immigrants will not have a major economic effect in 2015. I still believe that there is a strong need to advance to a market based immigration system respectful of rule of law and human dignity, such as the Red Card solution. I expect minor advances in free-trade. Freer trade is a major engine for growth but the increased politicization of the debate thwarts fast progress. The efforts to increase trade liberalization between the United States and Europe are moving slow. According to the Index of Economic Freedom of The Heritage Foundation, Europe and the United States have the best world regional scores on trade freedoms. Europe scores 86.4 (where 100 is best) and the US 86.8. Fraser Institute’s freedom index is not so generous, with most European countries and the U.S. scoring between 7 and 8 (out of 10), which is still good. Mexico and Canada together count for approximately 30 percent of total U.S. trade and also for one-third of U.S. exports. Their economic growth is very relevant for the U.S. but no big increase is seen here. Canada and Mexico grew at a modest 2.4-2.5 percent last year. While the Mexican economy is forecast to pick up somewhat at 3.5 percent, the Canadian forecast calls for a slow down to 2.2 percent. I believe that further liberalization would create very positive results, retaining the status quo will not have dramatic negative effects. The major government efforts to increase trade among developed countries are the Trans-Pacific-Partnership (TTP), mostly towards Asia, and the Transatlantic Trade and Investment Partnership (TTIP) with Europe. Both have many friends and foes. A major coalition of labor, environmental, and political NGOs, close to Obama’s base, ranging from the Democratic Socialists of America and the Pirate Party, to the Sierra Club and the ACLU, oppose the deal. They are focusing on blocking fast-track negotiating authority to the administration. On the other hand, most corporations, from Exxon to Facebook, have their own TPP coalition to support the pact. Each of these coalitions have approximately 150 corporate and trade association members, almost all with lobbyists in Washington. Any wonder why salaries and real estate are so high in the Capital metropolitan area? Polls show an overwhelming support for trade in both Germany and the U.S. (with Germans favoring trade more than Americans) but the negotiations for TTIP are also moving slowly. President Obama’s search for a positive legacy in the international arena might still lead him to turn his back on his more ideological base and push to approve TTP and TTIP. 2015 should be a good year for the economy. The major economic challenges will come from corroding forces, which act like undetected cancers, and not from a radical change in a policy or in an economic sector. The effect of increased arbitrary use of executive power, abuse by regulators, and the growing relevance of privileged forms of capitalism—usually labeled “crony”—have been taking the U.S. down in the rule of law rankings. Respect for an impartial judicial system and property rights occupy an important place in the economic freedom indices. 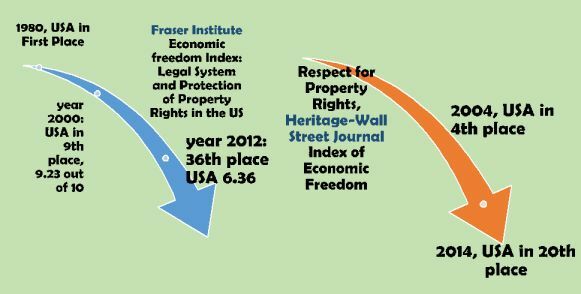 In 1980, the first year measured by the Fraser Institute index, the U.S. was in first place for its legal system and protection of property rights. It is 36th in the latest. The score went down from 9.23 (10 being the best) in the year 2000 to 6.99 in 2012. In the Heritage index respect for property rights in the U.S. went down from 4th place in 2009 to 20th today. The rule of law index of the World Justice Project has the US going down, this time to the 19th place. The trend is dangerous. Will the new legislature stop this gradual fall from exceptionalism to mediocrity? Too soon to tell. Lovers of free enterprise and the free society really hope so, but do not hold your breath. Lower scores for respect of private property and rule of law a long term challenge for the U.S.